The Joe’s Box is an amazing device. Basically, a spirit box but with a twist. This is the only box I have used that allows replies to come in with a crystal clarity that most find it hard to believe it is actually working correctly. This box does NOT always work for me though. It seems to have good days and bad days and on a bad day, NOTHING! On a good day, INCREDIBLE! 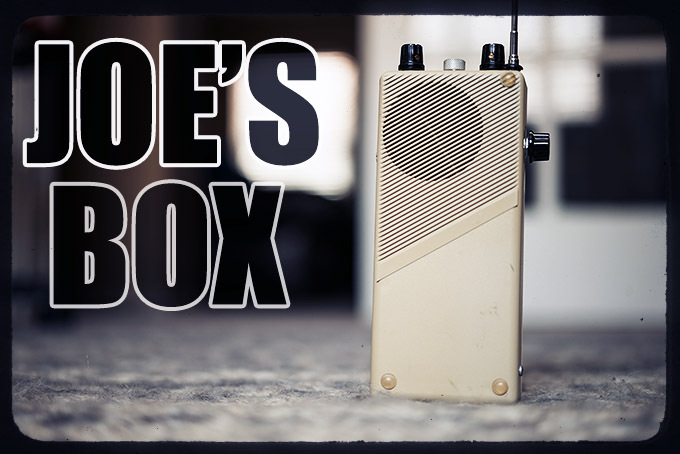 The Joe’s Box is very rare and only a handful are out there in the world as the creator, Joe Cioppi (hear an interview with him here), sadly passed away. I remember talking to Joe via e-mail two years ago and he was going to make me a box when he was no longer sick, but he did warn me about the effectiveness of the box and told me if it scared me to NOT buy one from him. Of course I said I WANT ONE but it never came to be as he passed before he could build one for me. When he passed my heart dropped. From what I understand he was very passionate about this field and I will use his box for as long as I do this as it is an incredible tool. I was able to buy a Joe’s Box from someone who sold their #3 box, and I will never sell it. It is not only a piece of history but as of today, June 2014, there is no spirit box quite like it. Many ask me how to buy one..well, you can’t. Only a handful were made (numbers are reported to be as little as 6 to as high as 30) and the only way to ever find one is to wait for one of the lucky owners to sell theirs, which is unlikely. If they do sell, today the values are anywhere from $800-$2000. Below are the videos where I use the Joe’s Box! The day I received the box..I drove to a cemetery and did a session in my car. What came through shocked me and excited me. When putting all of the words together it describes how someone died. Take a look. This is my most impressive session with the box and was my 1st. Did I connect with Joe Himself? Take a look and listen.. This one is pretty cool as it shows and proves I am getting the same voice from the radio, even in different states that are 1800 miles away. This makes it impossible for these voices to be radio. Take a look.. This one is the 2nd day with the Joe’s Box in Souther Illinois. Some AMAZING replies. How anyone can deny this evidence is beyond me. This time something different. What we catch here is a boys voice asking us a question..